Trick or treat? Treat, I hope! :). And what a treat I have for you, my friends. 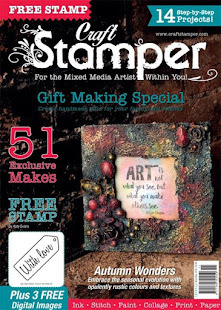 I bring you a brand spankin' new Fashionable Stamping Challenge! This time we challenge you to use Halloween colours. 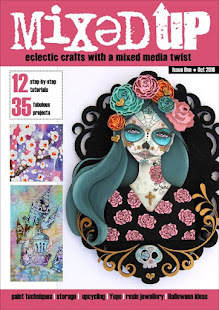 Bewitch us with a Halloween themed project or any kind of whichcraft based on a Haloween colour palette. Trick or treat us - the choice is yours lol ;). I've recently been to a crafty trade event and I was super impressed with a gorgeous collection of art that my new crafty friend Kim had with her (ps. 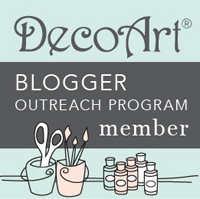 make sure to check out her blog as she creates lovely stuff!). It made me realise that I don't have anything that I could travel with, to show off the kind of projects I create. I'm not an ATCs gal and the projects I do usually go to a new home shortly after they were made... So... I've decided to make more tags. In case you've missed it, you might like to check out my previous post with a napkin art tag:). But back to my project. 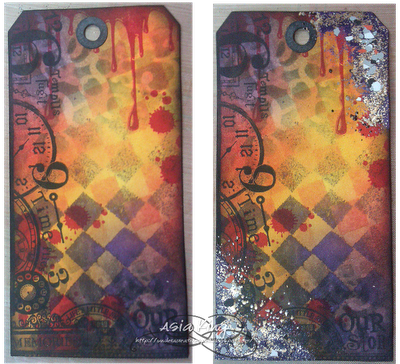 I started off with a white tag cut out from card using Movers and Shapers Tags die. First I inked the background with Dusty Concord, Spiced Marmalade, Wild Honey and Fired Brick distress inks. Then I sprayed some Tattered Angels mists through stencils. After that I stamped some Blood Splatters to fit in better with the Halloween theme lol :). The edges of my tag were then stamped with Word Collage Border stamps. And of course I could not leave the tag without my beloved Fran-tage technique, so I treated my tag with Aged Wine Embossing Enamel and Trick or Treat Colour Fragments, which are perfect for Halloween makes. Then I cut the dress form from a recycled card and covered it with tissue paper, which I first inked up and stamped with the Roses stamp. Then I dressed my Halloween gal with a suitable attire, using some ribbons and died lace. My Halloween lady could not have been left without any means of transport to the Halloween party so... I made one for her, using tiny twigs from my garden :)). That's all for now my friends, I'm putting my witch's hat on and I'm off to do some trick or treating :). Please make sure to check all the fantastic projects created by the Fashionettes and I look forward to seeing what you create! Thanks for popping in and your sweet comments. Wow Joanna this is fabulous. I love the Halloween dress form, the background is a perfect backdrop and live your broom. Ha! Ha! Love that broom! Too funny as I was thinking about making little witchy brooms the other day! Honestly this is so elegant and I love your take on Halloween! What a wonderful job you have done here. Sorry i have been away from commenting for such a long time. I am much stronger now, so will take a peek back over some of your older posts which I had missed. off to check out your friends link first! Wow...Love the colours! Love the background! Love the blood! An awesome tag Joanna. Spooky elements and yet you managed to make it look so pretty! Wow, how breathtaking, love the use of the dress form die and all the wonderful lace. 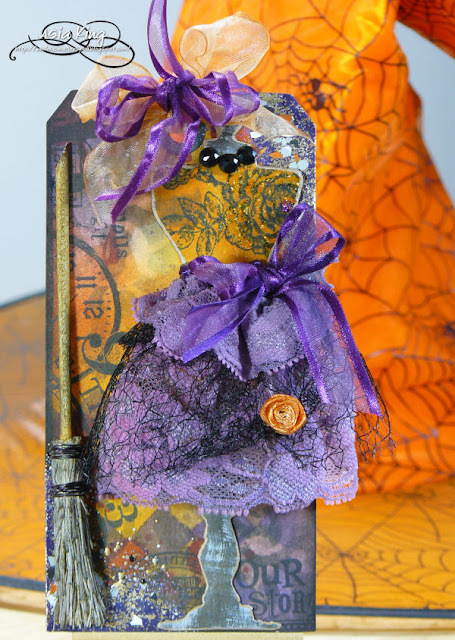 Hi Joanna what a fabulous Halloween project. I love the background and dress form. Great idea for the broom. I hope to play along at FSC this fortnight. gorgeous Joanna. what scrumptiously rich colouring. you can see the depth that you've built up in the background too. a beautiful tag. Awesome tag! The dress and the broom look great, and I love your choice of colors! Hi Joanna, Fabulous tag, and such an inky background. 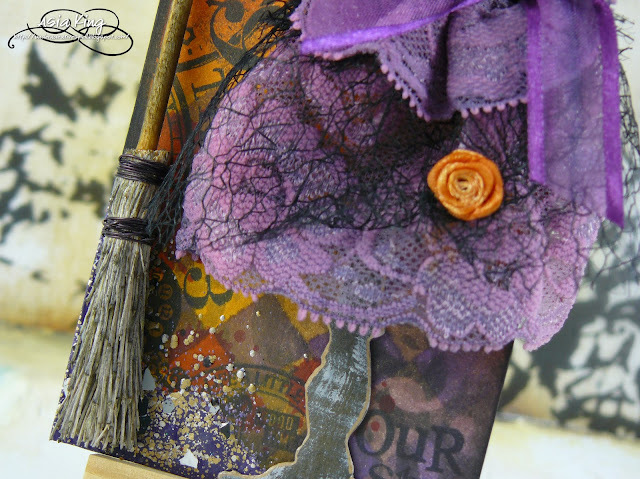 Love her stylish dress and the addition of the witches broom is a great idea. That broom is just incredibly fabulous and that wonderful background. Totally yummy tag! The background is a-ma-zing - so full of glorious gory colour and detail, and the broom is a brilliant finishing touch. Wow! 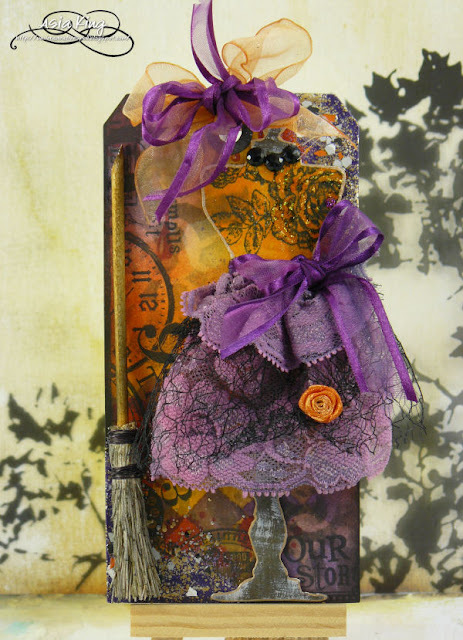 Fantastic tag, the background as well as all the additions, details and that awesome broom look amazing. Super tag, love the background you created. ps. przepraszam, że ślepak jeden, nie zauważyłam wcześniej, że to manekin. What a fabulous creation Joanna. Very nice background and details. This is absolutely stunning! 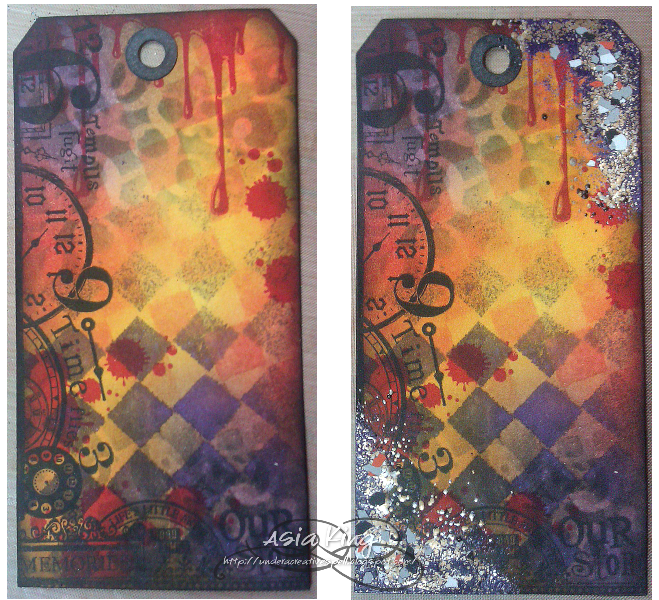 Love all the distressing and the great colors! Perfect for our color challenge! Thanks for playing with us this week at Party Time Tuesdays! Stunning tag!!! I love all the elements and your choice of colors. Very fun. I came to you from SCS gallery link. 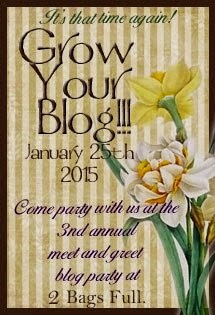 Beautiful blog and talent. Have a great day! This is gorgeous! You should do more tags! Thanks for joining Craft Your Passion. A gorgeous spooky tag Joanna. 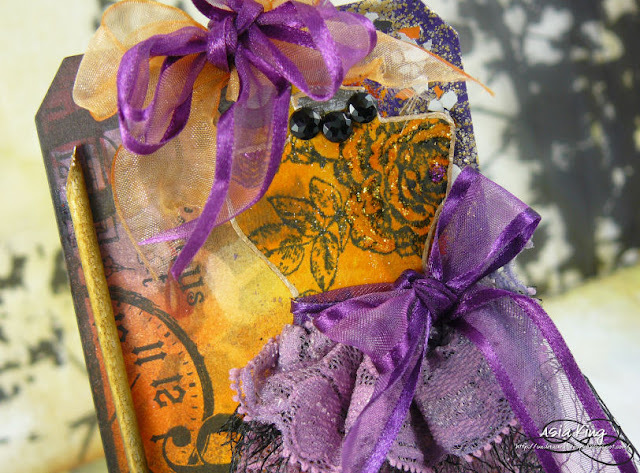 Love the rich colours and the textures you've added. For some reason (I suspect from the lace) it makes me think of Miss Havisham?! Absolutely stunning a complete brim full of the Joanna magic. I'm glad you liked all of the cards that I showed you at the Retailers day and thank you for the kind words.